All correspondence to the Association by e-mail please send to "clubmanager@rhkr.org"
We were saddened to learn of the death of SSgt Yeung Lak-hing Ricky 楊力興 (Force No. 18099610) on 05 April, 2019. SSgt Yeung was enlisted in the Regiment at 1980 (Cadre 36) and served in C Squadron. Funeral arrangement for last respect only. To his family, we extend our deepest sympathy. See details of event and fill in reply slip befoer 19 April, 2019. Our annual major function need your support. Members with their guests are welcome to join this traditional function. See the attachment for details and filled in the reply slip with payment send to the Temporary Clubhouse Manager befoer 17 May, 2019 the latest. Ceremony in memory of Late Maj. Graeme Large. The Church service for Graeme Large as follows. Date : Sunday 7 April, 2019. Venue : Emmanuel Church, Bethanie, 139 Pokfulam Road, Hong Kong. Members of Regiment are welcome to attend. Mr Lam was enlisted in the Regiment and served in C Squadron 1 Troop. Venue : 5/F., Universal Funeral Parlour (萬國殯儀館), Hunghom, Kowloon. Last respect can be paid on Wednesday 17 April, 2019 at 9-10 am followed by cremation at Cape Collinson Crematorium. Please click here to download the Newsletters January 2019. Please click here to download the Newsletters July 2018. Simply Download the Membership Reply form, fill in the information and post it. We shall process your renewal and issue a valid label to you within 2-week. Congratulation to the following members who were elected as Directors of the Board of The Royal Hong Kong Regiment (The Volunteers) Association 2018/2019 at the 2018 Annual General Meeting. "Parking for Clubhouse Members and Associate Members"
For details, please refer to the Circular. NOTICE IS HEREBY GIVEN that the 2017 First Extraordinary General Meeting of the members of The Royal Hong Kong Regiment (The Volunteers) Association will be held at 9/F., Happy Valley Stand, Wong Nai Chung Road, Happy Valley, Hong Kong on Monday, 25th day of September 2017 at 7:00 p.m. (or in the event that a black rainstorm warning signal or a tropical cyclone warning signal no. 8 or above is in force in Hong Kong at 9:00 a.m. on that day, at the same time and place on Tuesday, 3rd day of October 2017 for the purpose of election of Directors. For enquiries, please contact the Clubhouse Manager at phone no. 2966 7895 or email to clubmanager@rhkr.org. We were saddened to learn of the death of Maj Hugh McIntosh Dey MBE, ED at ninety-one. Maj Dey joined our Regiment in 1953 and served as Regimental Second-in-Command in 1979-1982. Last respect can be paid in the funeral to be held on Friday 24 February 2017 at 2 pm at Cape Collinson Crematorium, Chai Wan, Hong Kong. For further information, please contact his family at (852) 9459 0078. Donations in lieu of flowers can be made at his family's request to "The RHKR (The Volunteers) Association". Selling of PRI items will be resumed on 22 February 2017. The Clubhouse will be re-opened at 31 January, 2017 at 12 noon. We have received a message from Mrs Marian MacKenzie, informing us that her husband, Mr John MacKenzie, has been appointed to the rank of 'Chevalier de L'Ordre national de la Legion d'honneur' by H.E. the President of France. 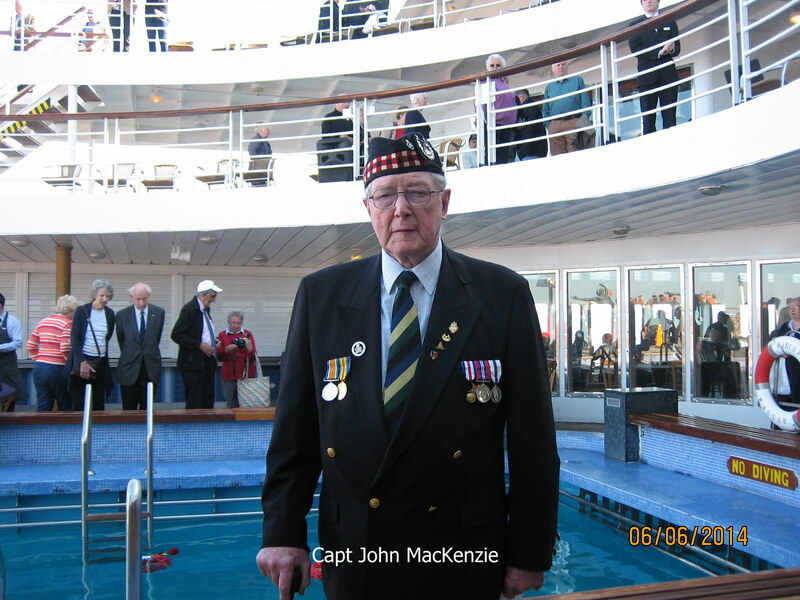 Mr John MacKenzie (now 89) joined the Army at Perth (Scotland) on his 18th Birthday and was engaged in infantry training on D-day 1944, completing this in December that year. In convoy from Tilbury in January, 1945 he was rescued when his troopship (HM-LST415) was torpedoed in the North Sea. He joined the 5/7th. Bn. Gordon Highlanders in Holland at Gennep, Reichswald Forest in February, 1945 and saw further action at Goch (Siegfried Line), the Rhine Crossing at Rees, and through northern Germany to Bremen and Bremerhaven where he marched in the Victory Parade of the 51st Highland Division on 12th. May, 1945. Post WW2 he served with the 2nd. Bn. 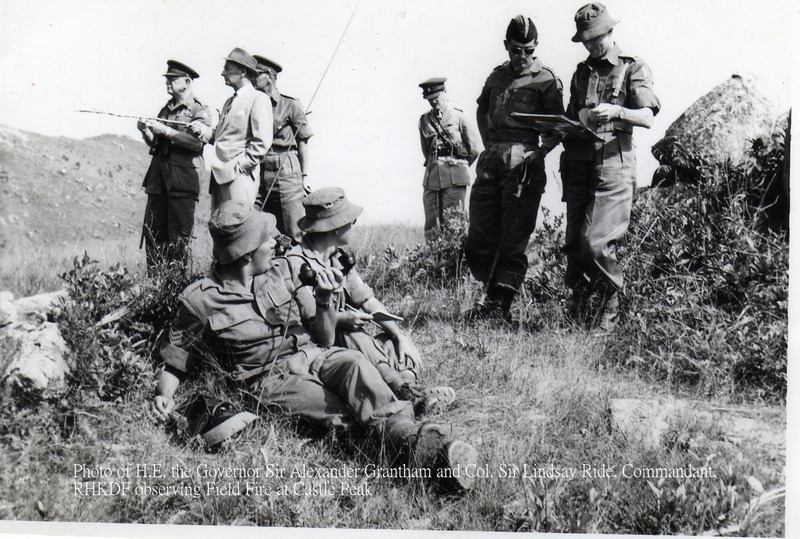 Gordon Highlanders in Libya in 1946, received a commission in the Royal Artillery in 1947, and was demobilised in 1948. He joined the Hong Kong Regiment (The Volunteers) in October 1954 and was re-commissioned in Hong Kong following the Korean Emergency and served with Royal Hong Kong Defence Force from 1954 until 1964, retiring with the rank of Captain, as O.C. Mortar Platoon. Mr John MacKenzie was a President of the Jaycees (1959) and of the Hong Kong Rotary Club (1975-76). He also served on the Hong Kong Urban Council from 1971 to 1980, and as a Justice of the Peace from 1973 to 1991. 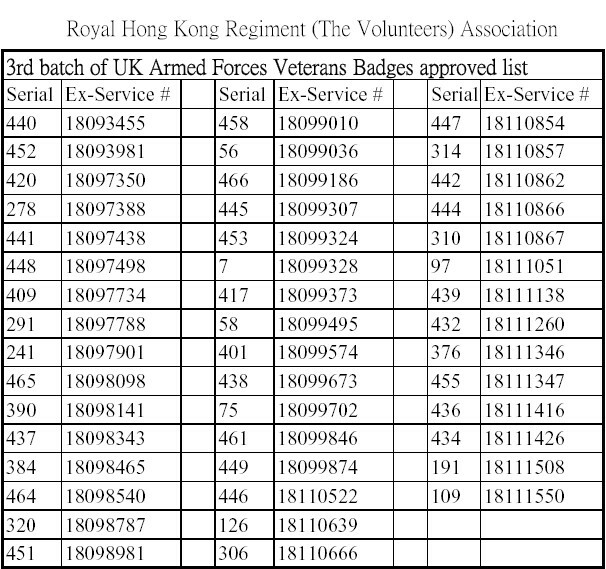 The Volunteer Association is the successor to the Royal Hong Kong Regiment (The Volunteers) following the disbandment of the Regiment on 3rd September 1995. All Volunteers who were members of the Regiment, the RHKVDC or the RHKAAF irrespective of rank are eligible to join. The Association has been granted a Club House in the Happy Valley Stand at the Jockey Club in Happy Valley. In this Club House there is a lounge and bar area where members meet. The Association has been granted charitable status and it is run by a Board of Directors. The Board meets regularly to give policy direction to the affairs of the Association. A Club House Manager is responsible for the day to day running of the Association Rooms and is a point of contact with the Association. The Association is also an umbrella organization for all other related clubs such as the Volunteer Shooting Club and the Volunteer Orienteering Club. These clubs run their own affairs charging a membership fee and annual subscriptions if they so elect. Mailing Address : P.O. Box 47296, Morrison Hill Post Office, Wanchai, Hong Kong. Clubhouse Fixed Activities below are not accept any bookings except approval. Please note that the Clubhouse will be closed from 27 to 30 January 2017 and re-opened as normal from 31 January 2017 at 1200 noon. Cost : International Buffet at $600 per person inclusive race badge and drinks from Jockey Club. Dress : Suit, Jacket, Regimental or Association tie. Congratulation to the members are selected as the Board of Directors at the Association AGM 2016. Available to sell at the Clubhouse at $140 special price. See Poster of the front page of the Book. Arrangement was made with Hong Kong Jockey Club for members of the RHKRVA are permitted to park at the Basement of the Jockey Headquarter (entrance from Wong Nai Chung Road turn right from Sport Road) from 1800 to 2200 hrs until 16 September,2015. (Parking spaces are subject to availability). Permission for parking must be informed one day in advance to the Clubhouse Manager by email at rhkrva@yahoo.com with information in the message of Car Plate Number, VA Membership Number, Full Name, Mobile Phone Contact, Date and Time for parking. See attachment of route map. Association Newsletter for December 2013 latest issue. 1. With the introduction of the Personal Data (Privacy) (Amendment) Ordinance 2012 the Association wishes to ensure that all members are well informed of the use of their personal data by the Association. 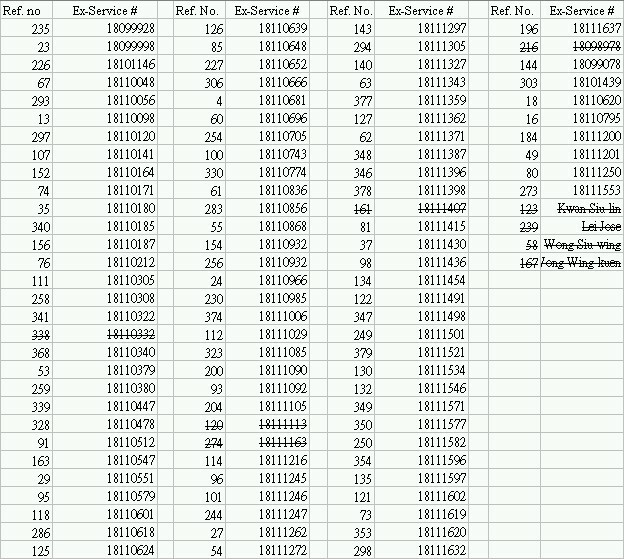 This data includes their addresses, telephone numbers and e-mail addresses. f. The Hong Kong Adventure Corps and other uniformed youth groups. 3. The Association will use your personal data only for the above purposes. Personal data collected will not be sold, traded or rented in any form or through any means to other parties. The Association will not pass details of the personal data held to a third party without the consent of the individual whose details are being passed. 4. Any member who wishes the data on him, or herself, to exclude any of the above shall communicate the fact to the Association's Club House Manager who will make a record of the fact. Would those members, who applications for the UK Armed Forces Veterans Badge could not be processed as the members did not have their Regimental Number and Dates of Service, please reapply through the Club House Manager. The discovery of certain records of service for members of the Regiment, who were discharged prior to the Regiment's disbandment, could enable the application to be processed now. Volunteers remember giving one day¡¦s pay for Life Membership of the Regimental Association. That association organised the annual dinner, a families¡¦ splash night and the dragon boat entry. It relied on the Regiment for its administration and clearly this association could not continue once the Regiment had disbanded. In 1993 its members voted for it to be wound up and dissolved. Hence that association no longer exists. At the same time a new association, with a slightly different name, came into being on a legal basis which could survive without the Regiment¡¦s support. After disbandment this new association took over some of the duties previously undertaken by the Regiment. These included assistance to Trailwalker and other charities, organising the Victory Day Ceremony at the City Hall and the Foundation Day Dinner. This new association became responsible for its own administration and the running of the club house which we did not have before. This new association is open to all ex-Volunteers, members of the old association, on the payment of a small annual fee, only HK$200 per year. This fee goes part way to maintain the clubhouse, financing the various organised events including the Happy Hour associated with film nights.Last year this new association changed its legal name to be the same as that held by the pre-disbandment association, namely The Royal Hong Kong Regiment (The Volunteers) Association. 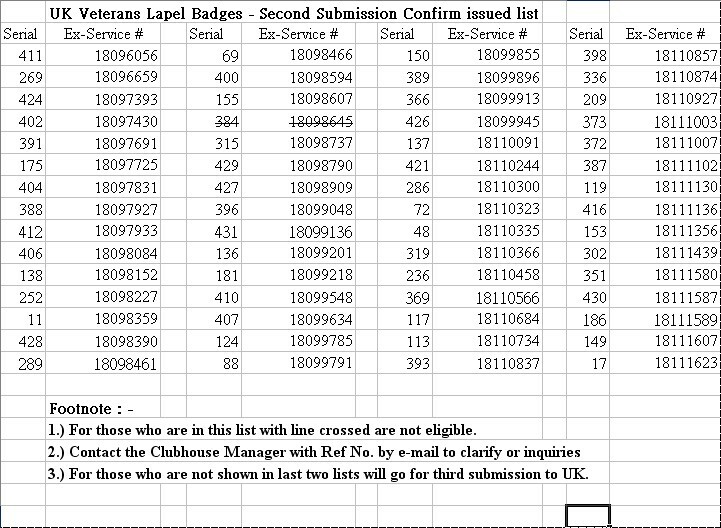 UK Veterans Lapel Badges - First Submission Confirm issued list. Footnote :- 1.) For those who are in this list with line crossed are not eligible. 2.) You may contact the Clubhouse Manager with Ref No. by e-mail to clarify. 3.) 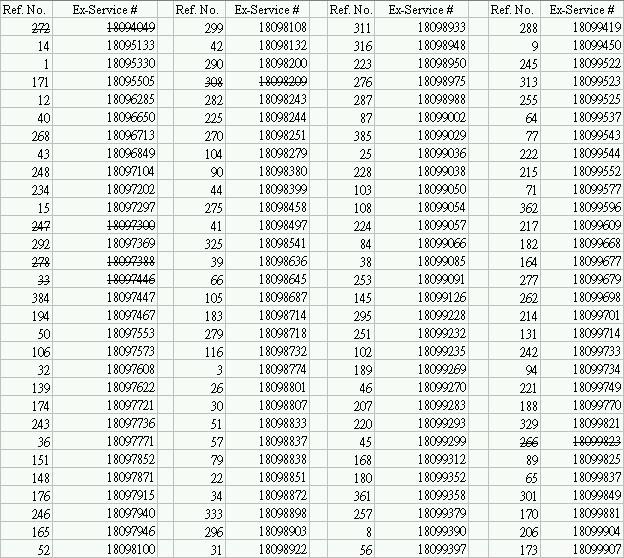 For those who are not shown in this list will go for second submission to UK. AGM2007 and Annual Dinner Photos - Please link to the following web. © 2015 RHKR The Volunteers Association Ltd.All rights reserved.